I can include quite a few comfort meals to my repertoire, one of which is Mie (Bami) Goreng, Indonesian fried noodles, also known as Mie Tek Tek and sold by street hawkers in Indonesia. Named after the sound of the spatula hitting the wok: ‘tek-tek’. Derived from the Chinese Low- Mein or Chow Mein but with an added Indonesian twist like Kecap Manis – Sweet Soy Sauce. So ‘Tek-Tek’ away to ensure your household knows these tasty noodles are ready to be served. 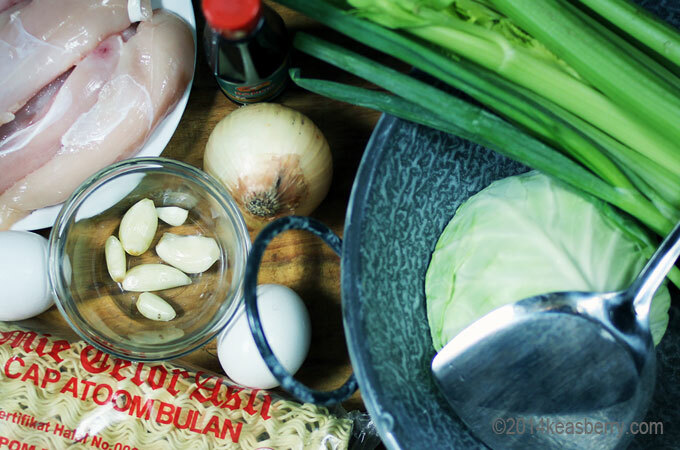 Try my simple version of this Indonesian fried noodles dish. There are some variations at the bottom of this recipe. Cook the dried noodles al dente and drain, rinse in cold water and drain again. Set aside. Beat the eggs with a pinch of salt . Bake a thin omelet and let it cool. Roll it up and cut it into strips. Set aside. 1) Meats / Fish: use pork, beef, fresh shrimps or fish balls . 2) Vegetarian: replace meats with deep fried cubed firm tofu. Instead of red chili peppers use bell peppers, thinly sliced. Add chopped bok choy or blanched sliced carrots. 3) Seasonings: add some sambal oelek (chili paste) after the onions and garlic and stir fry. 4) Garnish: add thinly sliced cucumbers, tomato wedges and serve some shrimp crackers with it. That looks delicious. I ate it while visiting Indonesia. I will now make it myself. Thank you!